I have been completely infatuated with the T-Rex meme craze since I saw my first one. I loved it so much that I bought my husband a tee shirt that says "T-Rex hates push-ups." Any meme that shows up on my feed about the many struggles of T-Rex, quickly gets shared! Well, imagine my thrill to find out that someone took that idea and ran with it... in a book! 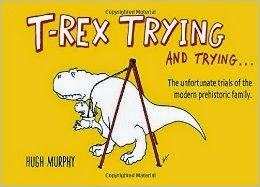 I missed out knowing that Hugh Murphy published T-Rex Trying, but was fortunate enough to receive a gratis copy of T-Rex Trying and Trying: The Unfortunate Trials of a Modern Prehistoric Family. And it is absolutely adooooooorable! Of course, one must feel sorry for poor T-Rex and his family, but it is hard not to let a giggle escape when we see pictures of T-Rex trying to do such simple tasks as trying to hula-hoop or even when poor T-Rex tries to spoon She-Rex in bed at night. Poor T-Rex can't even Trick or Treat! GIVEAWAY DETAILS: Hey, I don't have to hog all the laughs! One of you lucky readers can win themselves a copy of this book too! (Or if you can't keep your pants on, go buy yourself one!) This would be great to hog all to yourself, or even be a great gift! Heck, buy 50 and give one to everybody you know! Anywho, enter below, but only if you live in the United States. Sorry, rest of the world! Gosh, I have no clue. I am pretty short though.